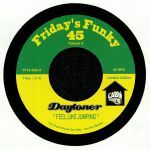 Discos en vinilo y CD de Friday's Funky 45.
Review: A decade has passed since Daytoner released his first record. 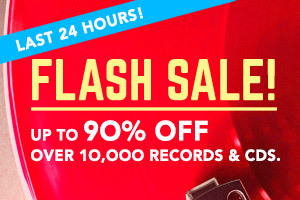 Since then, the Cornwall-based party-starter has delivered countless heavyweight slabs of sample-laden funk breaks and hip-hop-fired mash-ups. For his latest trick, he's decided to tool-up Marcia Griffiths' rocksteady classic "Feel Like Jumping". His revision is very much a "light touch" affair, despite the presence of some punchy new hip-hop drums and a sprinkling of spoken word samples. Flipside "Perfidious" is another loved-up, hip-hop ready reggae revision. It, too, hits the spot, suggesting that both cuts will go down a storm on a variety of party-hearty dancefloors.